Novelty items don't have to be useless. At Promotion Pros, we believe that novel and useful can go hand in hand, which is why we've developed a wide range of custom gum offerings. Our promotional gum packs are available in standard and in nutrient enhanced chewing gum packages, so you can choose what best suits the needs of your business and its clients. Either way, you can't lose. Whatever you choose, it will come in colorful packaging with your custom logo, company motto or business information. 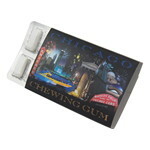 Our custom logo gum pack is a blister pack with 12 pieces of peppermint gum. This Vitamingum Chewing Gum is sugarless, gluten free, and does not contain aspartame. 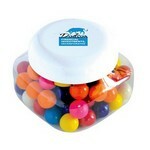 The Gum Balls in Small Snack Canister can bring back childhood memories among adult clientele. 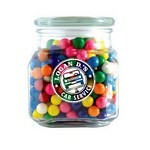 The Gum Balls in Large Glass Jar are fresh, tasty, and have a long shelf-life.